I have vivid recollections of browsing through the Peterson Birds of North America book throughout my childhood. My mother and I still watch for rare and unusual birds. As a biology teacher, having access to a detailed and accurate field guide to birds in our area is an absolute must. When I heard about the iPad version of the Peterson book, I knew that I had to take a look at it for our MyMac.com readers. 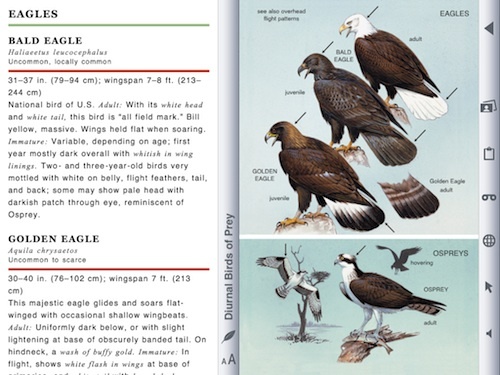 True to the form of the paper version of the book, the iPad version of the Peterson Birds of North America is filled with rich illustrations and a wealth of information about birds that live throughout the continental U.S. 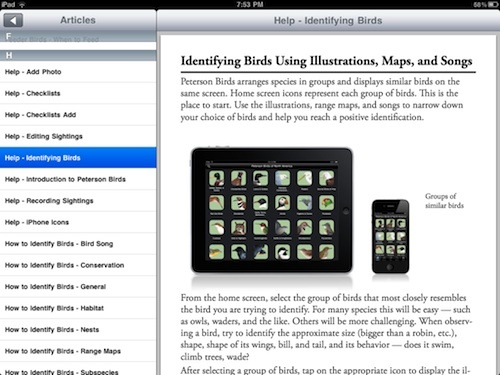 Anyone who loves bird watching will definitely want to add this app to their library. Upon opening the app, you’re presented with a richly illustrated display of 37 bird “families” and three links to extra features. Selecting one of the bird families takes you to another screen that is filled with amazing classic illustrations of various species of birds in the group. The illustrations can be scrolled through with a swipe of the finger. Tapping on any single species automatically blurs out all the other species. 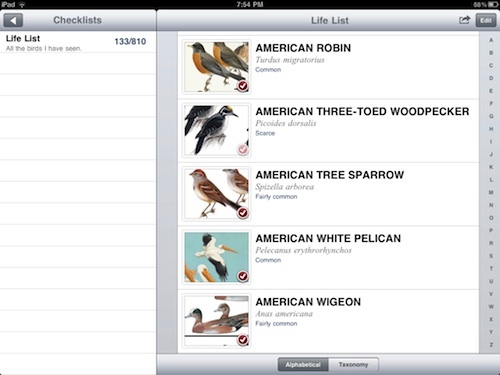 This allows the user to then select options that provide a wealth of information about that bird species. 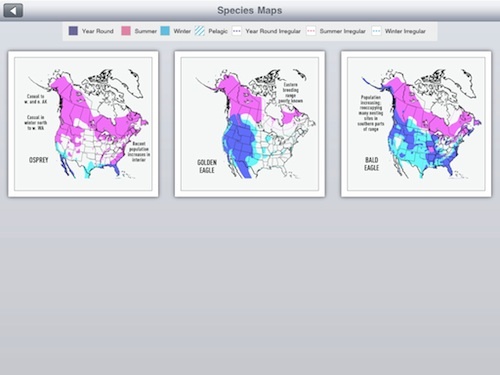 These options include a list of quick facts about the species, a map of its habitat range in the U.S., an image of the species’ nest and eggs, a list of related species, and the option to add your own photograph of the species to the book’s database. That’s a really appealing feature to avid bird watchers and photographers. Tapping a speaker icon plays the species calls, which is a big help in identifying species in the field. Yet another icon sends you to a detailed list of information about all aspects of any given species. Another great addition to the app is the “Life List” feature. As you look at each species in the book, you can add your own sightings to the book. With each sighting you can include date, location, count, weather, and additional notes data. I really like this feature as a bird watcher. It’s always fun to look back at sighting reports to recall the excitement of seeing a rare species. There are also a number of extra features included in the app. One of the links on the opening screen takes you to a listing of the American Birding Association’s List of Birding Ethics. This is especially important for those of us who want to observe nature with as little impact upon the environment as possible. The other two links on the opening screen take you to your life list and list of sightings. 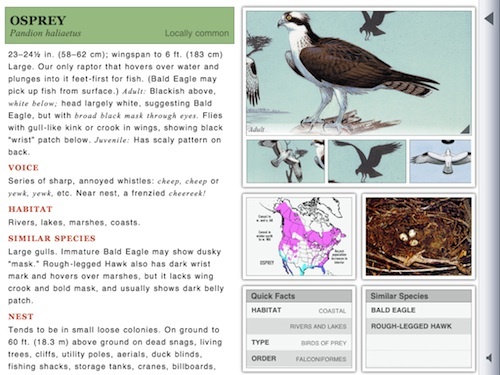 They both provide well illustrated and detailed entries for each species you have on your lists. From here you can also edit the data for each sighting. 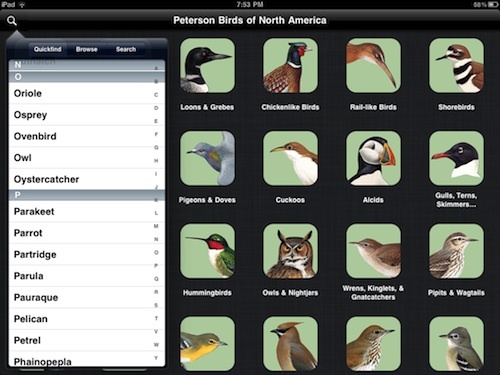 I really think Appweavers, Inc. hit a home run with their version of the Peterson Birds of North America iPad app. Anyone who loves birding and the outdoors will get many hours of enjoyment from using this app to supplement their lifelong hobby. Author’s Correction – the price of the app is actually $29.99 USD, not $9.99. I listed a promotional price mistakenly. My apologies to the readers.